History of Dentistry Although the practice of Dentistry is rooted in ancient times, dental care was pretty grim prior to modern times. There were no diagnostic procedures, no preventative procedures, and crude restorative and surgical techniques. The available treatments were likely to be administered by charlatans. They were usually ineffective and death from dental infections was not uncommon. Without effective pain control techniques, dentistry was hideously painful. Pain control consisted of brute force, alcohol (usually brandy, rum or whiskey) or opium. There was no way to control these remedies, so patients were either under- medicated or over-medicated. Operations had to be conducted in a matter of minutes, and if an operation lasted more than 20 minutes, the patient would likely die of exhaustion or shock 2. Needless to say, Dentistry did not enjoy a good reputation. Only 3 dental schools existed in the United States at the end of the civil war, and many dental practitioners(barbers, blacksmiths and apothecaries) were apprentice-trained itinerants. Some people sought dental care from their physicians “whose skills included simple extractions, lancing and bloodletting”. Others tried “self care” from periodicals like “The Family Physician and Guide to Health” (published in upstate NY in 1833). In the first half of the 19th century, transportation to established dental offices was often impossible or risky, and the exchange of information among dental practitioners was difficult. In 1841, for example, 23 out of 100 boats leaving St. Louis sank before reaching their destinations. The dental profession owes a profound debt of gratitude to a remarkable Frenchman named Pierre Fauchard (1678-1761). Known as the father of modern dentistry, he collected all that was known in the West about Dentistry, organized it and presented it in an epic work titled “Le Chirurgiendentiste; ou, traite des dents (The Surgeon-Dentist; or, Treatise on the Teeth). In this book, which was published in 1723, he described dental decay, tooth anatomy, oral diseases and dental deformities. He was the first to practice dentistry in a scientific manner and the first to provide practice management techniques for the enhancement of patient comfort. His book outlined highly sophisticated procedures for tooth extraction, disease prevention and dental restorations. He was one of the first practitioners to advocate scaling of the teeth and debridement of the root surfaces to prevent periodontal disease. Many of his ideas are still accepted, and they certainly were way ahead of their time. 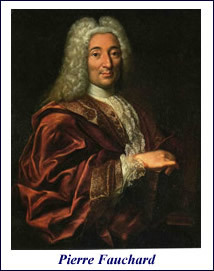 Pierre Fauchard was a true professional—he challenged the notion that practitioners should jealously guard their knowledge and skills and he was a strong proponent of enforcing the edict of 1699, which required dentists and other professionals to submit to examination before being allowed to set up practice. Unfortunately, the edict was never enforced. There were no universal standards for infection control in Dentistry until the 19th century when Alcock (1827) and Lister (1860’s-1870’s) advocated disinfection with chemicals. The importance of hand washing as an important infection control measure was first advocated by Semmelweis in 1861. Pasteur’s new science of microbiology (18601880) and Koch’s postulates for infectious disease investigation (1870’s-1880s) advanced the understanding of pathogenic microbes and the transmission of disease. The most important advances in infection control really occurred in the 20th century. In 1929, Alexander Fleming discovered penicillin, revolutionizing the treatment of simple infections (which were commonly fatal). Since then many antibiotics have been discovered, and death from dental infections is today a rarity. Sterilization techniques for dental instruments improved during the 20th century and in 1950, Appleton was the first to declare that sterilization by heat is the optimum method for sterilizing dental instruments. The AIDS epidemic has had a major influence on infection control practices in all medical and dental settings. Since 1991 universal precautions, such as the application of latex gloves and improved management of infectious waste and sharps, has made the dental office a much safer place. 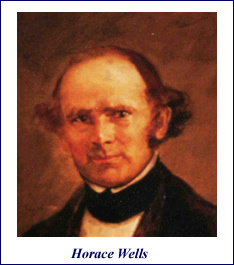 Horace Wells Real strides in Dentistry only became possible with the development of adequate techniques for anesthesia. Horace Wells introduced the use of nitrous oxide for dental anesthesia in the 1840s, and the first anesthesia machines appeared in 1902. Although its use fell in disfavor because of its weak anesthetic properties, nitrous oxide continues to be used today for its “second gas effect. Two main discoveries paved the way for local anesthesia-the development of the hypodermic syringe in 1851 by French physician Charles Pravaz and Viennese physician Charles Koller’s discovery of cocaine as an anesthetic in 1884. In 1884, William S. Halsted used a 4% cocaine solution in a hypodermic syringe to deliver the first mandibular local anesthetic block. The deficiencies and dangers of cocaine, however, led to a search for a substitute. In 1905 Alfred Einhorn discovered procaine (novocaine)–first widely used anesthetic. Other local anesthetic agents were discovered later. Dentures prior to 1850 generally did not fit well, picked up odors and discolored easily. They were made from a variety of different materials including bone, ivory, a variety of metals, tortoise shell, porcelain, pearly, coral, wax, gutta percha, celluloid. The teeth were made from bone, ivory, walrus and hippopotamus tusks, china, earthenware, porcelain and metal. Even human teeth were used-battlefields were rich hunting grounds for denture teeth (hence the term “Waterloo Dentures”2). There was no material that could be custom fit or allow fusion with fresh material to compensate for discrepancies. In the 1850’s, vulcanite-a hardened rubber–became the most widely used denture material. Although the first synthetic resin -bakelite- was invented in 1907, it was not until 1934 that Neo-hecolite – the first acrylic resin- became available to dentistry. The following year saw the introduction of a powder-liquid acrylic prototype similar to what is used today. Acrylic resin not only revolutionized denture construction, but crown and bridge procedures as well. Acrylic is today’s most widely used material for fabricating denture bases, denture teeth and temporary crowns and bridgework. Today’s denture teeth are made from acrylic, composite or porcelain and come in a plethora of sizes, shapes and colors. Hand burs-the mainstay of drilling techniques in the 18th and early 19th centuries for excavating teeth probably evolved from ancient techniques. The 19th century saw the evolution of the dental drill through successive inventions. The first dental engine appeared in the 1860’s. In 1870, Morison patented the treadle engine, and it was powered by foot pedals. 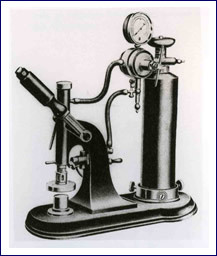 Doriot’s handpiece of 1893 was the first design that employed an electric motor to directly power the handpiece. Early drills were difficult to control and operated at low speeds, making excavations tedious1. In 1957, the S. S. White company introduced the first clinically successful high speed handpiece – the Borden Airotor. Today’s high speed handpieces operate at speeds of more than 300,000 rpm5–faster than a jet engine! This fine cutting tool makes it possible for teeth to be easily and quickly prepared. Although lasers and air abrasive units are being used for some drilling applications, they have yet to approach the precision and accuracy of the high speed handpiece. crude soldering technique. Cast inlays and crown restorations were not available until William Taggert’s invention of the casting machine and invested pattern technique in 1907. The porcelain jacket crown was introduced by Charles Land in 1903. Porcelain fused to metal restorations did not become available for Dentistry until the 1960’s. Amalgam alloys arrived on the American scene in 1826, once Taveau of Paris demonstrated that it could be used effectively. Early amalgam alloys exhibited either expansion that caused tooth fracture of teeth or contraction resulting in leakage. There was an enormous and bitter controversy in the 1840’s and ’50’s about the toxicity of mercury in amalgam, and standards for amalgam did not appear until 1919. The development of the dental drill in tury made it possible to deliver routine and efficient restorative dental care. At that time Dr. G. V. Black devised his famous system of operative procedures, which are still taught and widely practiced. Bonding materials were discovered in 1955 by Michael Buonocore at the Eastman Dental Center in Rochester. In 1967 he introduced the composite prototype of the materials that are used for bonded restorations today. The composite consists of a plastic resin filled with glass or quartz particles. Since the late ’70s, composites have been used for fillings, bonded veneers, porcelain laminates and cementation of restorations. Favorite Dental Chair*The Favorite Dental Chair, manufactured by the Ritter Dental Manufacturing Company. was put on the market on January 1, 1901 and cost between $150 and $172 depending on whether the upholstery was ordered in seal leather, cane, or mohair plush. The sectional headrest was $10 extra. The range of the Model No. 1 Favorite Chair was from 18 inches at the lowest position to 35 inches at the highest position. The lowest position of the chair when tilted back was 12 inches. Ritter’s 1901 Illustrated Catalogue of Dental Furniture, Instruments and Materials describes the many new features of this chair ‘which experience and experiment have proven to be practical and of great value to the operator. These are not accidental charms, the catalog explains, but every part and every movement has a well defined purpose. It has won universal favor purely because it meets every requirement, and because of its simple ability to give satisfaction. developed a number of years before, as original and radical improvements of all existing forms. Simplicity was the keynote of all these innovations, and the real element of our success. With this issue of our catalog we are pleased to announce the completion of the first practical Alternating Current Dental Engine, which bears all the marks of simplicity of our direct current type, and is susceptible of a like regulation of speed, instant stop and reverse. We derive a whole lot of pleasure from the many kind things said about our goods, and this latest production we hope will be of like credit to us and a source of satisfaction and comfort to our customers. The design, construction, and finish of every part of our Chairs and Electric Engines combine to produce the finest product of modern thought and machinery. Foley, Gardner; “History of Dentistry”; Review of Dentistry edited by Maynard Hine; The CV Mosby Company, 1975. Chancellor, Dr. James; “Dr. Well’s Impact on Dentistry and Medicine”; JADA, Vol. 125, December, 1994. Ring, Dr. Malvin; Dentistry: An Illustrated History; C. V. Mosby Co.; 1985.